The iconic science fiction TV series "Star Trek" first aired on Sept. 8, 1966 and celebrates its 50th anniversary in 2016. The show chronicled the voyages of the starship USS Enterprise. The studio model of the ship (shown here) has been fully restored and is on display at the Smithsonian National Air and Space Museum in Washington, D.C.
Fifty years ago today (Sept. 8), television viewers were first introduced to the crew of the USS Enterprise. On that fateful day, audiences watched the now-famous characters of "Star Trek," including the leading trio of Kirk, Spock and McCoy, struggle (for the very first time) to solve a mystery taking place on a strange alien world. The first aired episode of "Star Trek," titled "The Man Trap," features a mysterious woman who looks older or younger depending on which crew member is looking at her. What is causing this? The legacy of Star Trek is more than four decades old and still going strong. See the evolution of Star Trek in this SPACE.com infographic. But the original 1960s series, complete with its campy special effects and clunky fight scenes, still has an audience today. Just ask Brooks Peck, a curator at the EMP Museum in Seattle who spent months gathering props from the original series for a temporary exhibit currently on display at the museum. "Characters are a big part of it, especially the combination of Kirk and McCoy and Spock," Peck said in an interview with Space.com. Simply speaking, Kirk is famously seen as a captain who always follows his gut, Spock as a highly rational alien and McCoy as falling somewhere in between, but always ready with a witty comment about Kirk's or Spock's choices. "That was just one of those unpredictable bits of on-screen chemistry and great writing that brought them to life," Peck added. "In a broader sense, though, I really think 'Star Trek' is aspirational. One [reason] is the science-fiction utopia that we see in 'Star Trek.' We see these cool devices, and … at least for folks in the [United Federation of Planets], there is no more war, there is no more poverty. And if you look at it closely, you see no more work, because there is no need to work." A promotional ad for the original "Star Trek" TV series in 1966. The surprise star of "Star Trek" was Spock, a half-Vulcan alien who reportedly made NBC executives nervous because his ears and skin color reminded them of the devil. As the series evolved, Spock was shown to be from a society that trains out emotions in childhood. But Spock's half-human personality sometimes bursts through. Spock (played by Leonard Nimoy) was a hit almost immediately. The new documentary "Building Star Trek," (which debuted on the Smithsonian Channel last week and will continue to air this month), talks about young girls writing fan letters expressing their love for the Vulcan. Spock continued to attract a loyal following at fan conventions over the decades, and Nimoy also appeared in two films in the newest "Star Trek" movie franchise. In recent years, however, Nimoy was slowing down from the effects of a respiratory disease he attributed to a heavy smoking habit in his youth. He died in February 2015, sparking both his son Adam Nimoy and his son-in-law David Knight to produce documentaries on his life. Adam Nimoy's film is called "For the Love of Spock," and Knight's is titled "COPD: Highly Illogical - A Special Tribute to Leonard Nimoy." "I'm partial to Mr. Spock, [and] his character was someone that people could look up to," Knight told Space.com in an email. "His intelligence, coolness under pressure, logical thinking and his dry sense of humor really resonated with fans, and [that] continues to this day." But Knight also paid tribute to the rest of the original-series crew calling them "a group of diverse and intelligent people" who knew how to work together well to achieve a common goal. Presciently, series creator Gene Roddenberry gave his show a racially and culturally diverse cast, including communications officer Nyota Uhura, played by black actress Nichelle Nichols; helmsman Hikaru Sulu, played by Japanese-American actor George Takei; and Russian navigator Pavel Chekov, played by Walter Koenig (who was not actually Russian). This diverse casting took place while segregation was still a reality in the southern United States and the country itself was in a Cold War with Russia. "Star Trek" returned to television in 1987 with "Star Trek: The Next Generation," which followed a new crew on the USS Enterprise-D. This summer, parallel "The Starfleet Academy Experience" exhibits ran at the Intrepid Sea, Air & Space Museum in New York City and the Canada Aviation and Space Museum in Ottawa, Canada. The exhibits invite museumgoers to undergo training as new Star Trek enlistees would, focusing on matters such as learning the Klingon language or reviewing medical procedures. Alex Benay is the president and CEO of the Canada Science and Technology Museum Corporation, the parent entity of Ottawa's space museum. He had the chance to observe the exhibit's effects on young museumgoers, including his own 12-year-old son. Benay's son watched the entire original series on Netflix after watching the new movies, which were released in 2009, 2013 and 2016. "He respected the original series — this is how it started, this is Captain Kirk and Spock," Benay said. But his son noticed a lot of differences in how television was run in the 1960s, such as how most problems were wrapped up in a single episode. Multi-episode arcs were more common during "Star Trek: The Next Generation." But Benay's son was also aware of how these older characters have embraced their "brands" and still put them on display today, Benay said. "In the first new 'Star Trek' movie, they had Spock [Nimoy] cameo in there because he was traveling through time," Benay said. "My son saw the links there, I think. That was really well-done by the movie, to bring in the past and the new generation of 'Star Trek.'" 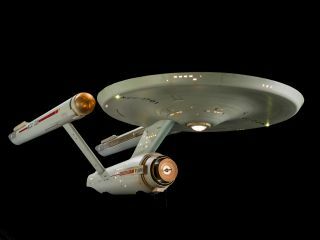 Original "Star Trek" artifacts are on display until March 2017 in Seattle's EMP Museum. For fans old and new wanting to capture some original-series magic, the EMP Museum's Peck said his exhibit would run until March 2017. The museum is considering continuing the exhibit as a traveling exhibition, if the original owners of the props are interested and the budget is there, Peck said. Peck said he feels "Star Trek" will always have an audience. "It's just darn cool. It's fun and it's interesting," he said. "If you're geeky, you can kind of geek out on the tech and the science fiction, but if not, [you can] still be into the stories, the original conflicts. It's romantic in that capital R sense: the big sweeping vision of a really amazing future history, and people are really engaged in this pursuit."